So this is a fairly famous cocktail in the Caribbean, but I can’t use it’s more popular moniker (Painkiller) because it’s actually owned by a fairly powerful liquor company. So I’m naming this version after the island upon which I first enjoyed it, Jost Van Dyke in the British Virgin Islands. I can attest to it’s anesthetic qualities because after four of them I fell off my stool onto my face and felt … absolutely nothing. But before I arrived at oblivion, I did notice that it tasted really good. So does this one. Just be sure to cut yourself off at three. Shake together the rum, pineapple juice, mango juice, coconut water and Campari in a cocktail shaker filled with ice. Strain into a Tiki glass filled with ice and top with freshly grated nutmeg. Cocktail umbrella optional. Wonder what I can use to substitute for Pineapple? I’m actually allergic to it. I only found that out recently but I used to drink these at a popular bar until I was told no more pineapple… I know I could use O.J but that’s kind of bland. I’m also allergic to cantaloupe so I can’t juice that up. They didn’t say anything about mango though… Maybe a puree of peaches and mangoes with the coconut water…. 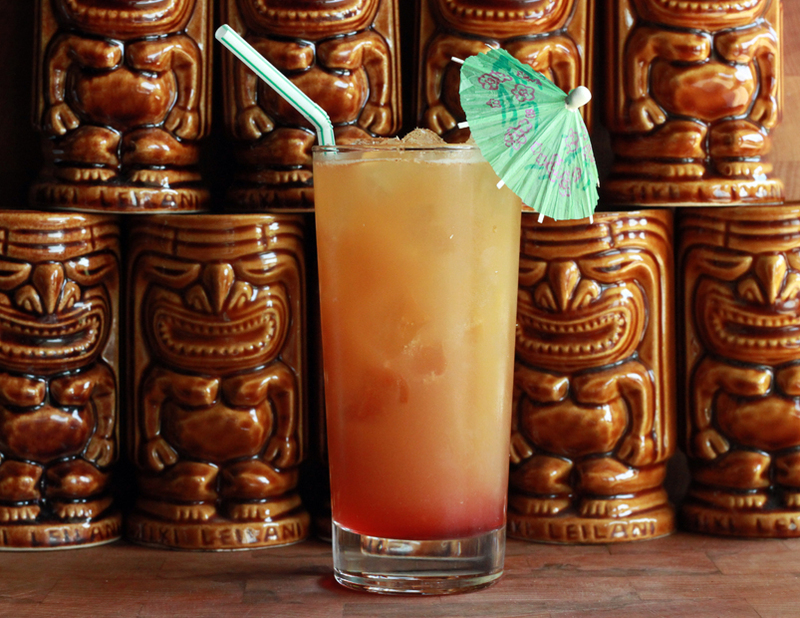 We make Hurricanes with Passion Fruit Juice, but have used pineapple juice successfully before. Maybe Passion Fruit juice would work here. It’s an herb infused liqueur from Italy. Most liquor stores will likely have it. I loved them there…you had to order the strength – a 1, 2, 3, or 4 – and pronounced Pinekiller….good memories! But i would add a little lime and in crushed ice. You had me at Campari. Sounds like a Jimmy Buffet drink to me so I will try it tomorrow at the concert! Pre game that is. Sound pretty tame for a Tiki drink. OK, nice drink and all.. but where can I get the wall of tiki tumbler mugs in the pic!!!! For someone with no access to a juicer, would canned mango work? Trader Joe’s, Kerns? Thanks for your contribution to my patio joy this summer. Love Jost, love the painkillers and love the conch fritters at the soggy dollar! I’m thinking this drink would count as a serving of fruit? I mean, then two of them would be more healthy, right?